LAS VEGAS – On the first Saturday of May, boxing’s top thoroughbred, global superstar and Filipino Congressman, Manny Pacquiao, won a resounding 12-round decision over Shane Mosley to retain his WBO welterweight title in the main event of a four-fight telecast produced and distributed by SHOWTIME PPV® and also available online at www.toprank.tv, http://sports.SHO.com, and www.sports.yahoo.com. 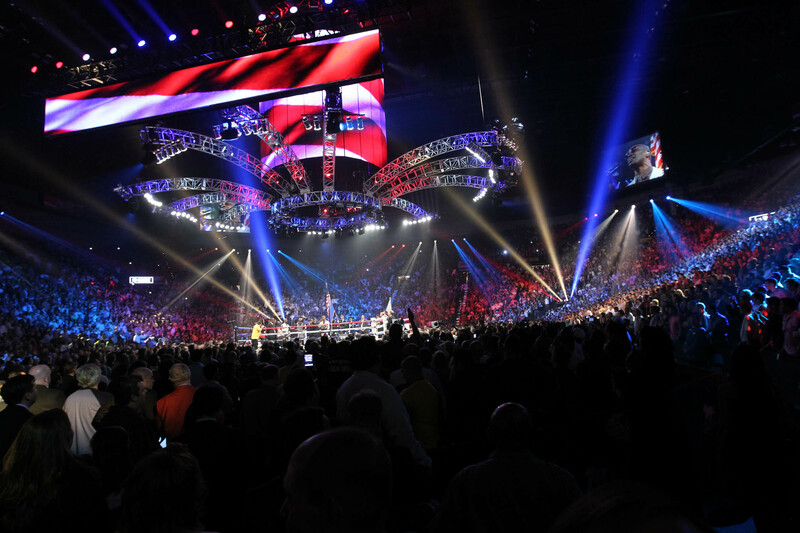 The one-sided victory before 16,412 at the sold-out MGM Grand Garden Arena was the 14th in a row for Pacquiao, of General Santos City, Philippines. An eight-division world champion, Pacquiao (53-3-2, 38 KOs) was victorious by the scores of 120-107, 120-108 and 119-108. Three division champion Mosley, of Pomona, Calif., dropped to 46-7-1 with 39 KOs. In other bouts on the telecast, Jorge Arce (57-6-2, 43 KOs), of Los Mochis, México, became the first Mexican boxer in history to win four world titles in four weight divisions when he scored an upset 12th-round TKO over huge favorite and defending WBO junior featherweight champion Wilfredo Vazquez Jr. (20-1-1, 17 KOs), of Bayamon, Puerto Rico, comebacking former world middleweight champion Kelly “The Ghost” Pavlik (37-2, 32 KOs), of Youngstown, Ohio, scored a majority decision over previously undefeated Alfonso “El Tigre” Lopez (21-1, 16 KOs), of Cut and Shoot, Texas, in a super middleweight scrap; and Mike Alvarado, of Denver, Colo., improved to 30-0 with 22 KOs with a third-round TKO over “Sugar” Ray Narh (25-2, 21 KOs) of Accra, Ghana, in a scheduled 10-round super lightweight match. 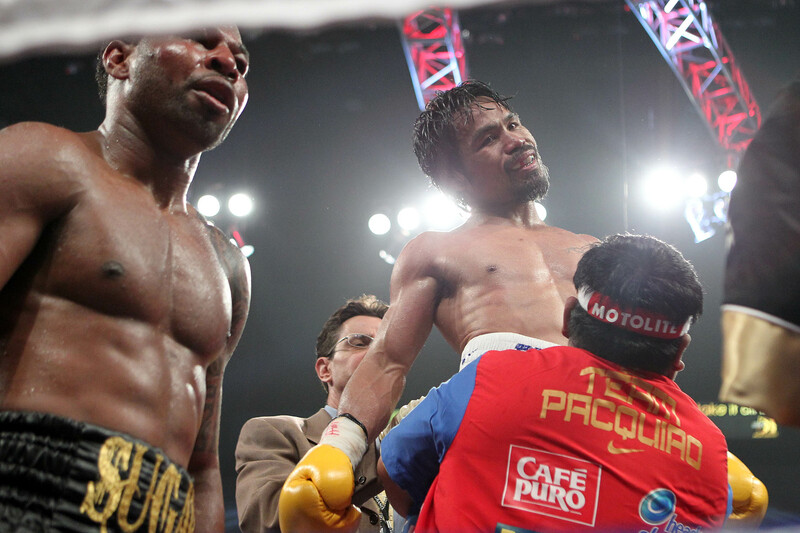 Pacquiao was the aggressor throughout. 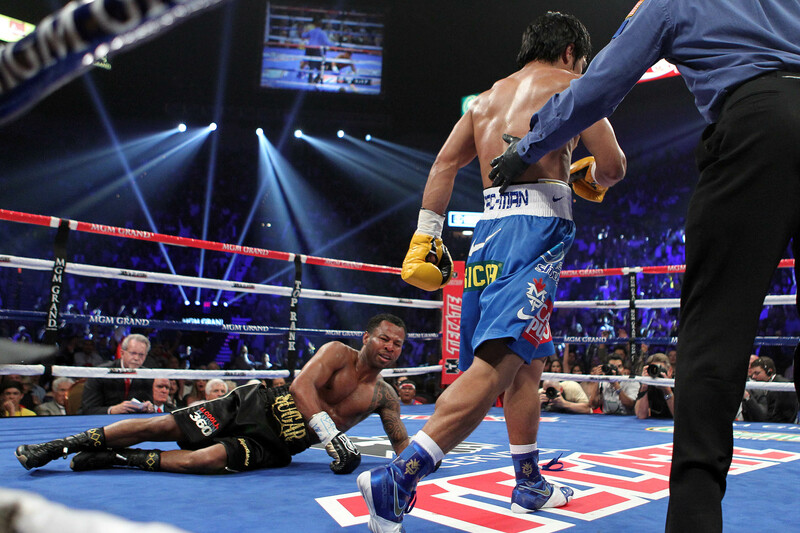 Each boxer registered a knockdown; Pacquiao dropped Mosley with a solid left hand in the third round. 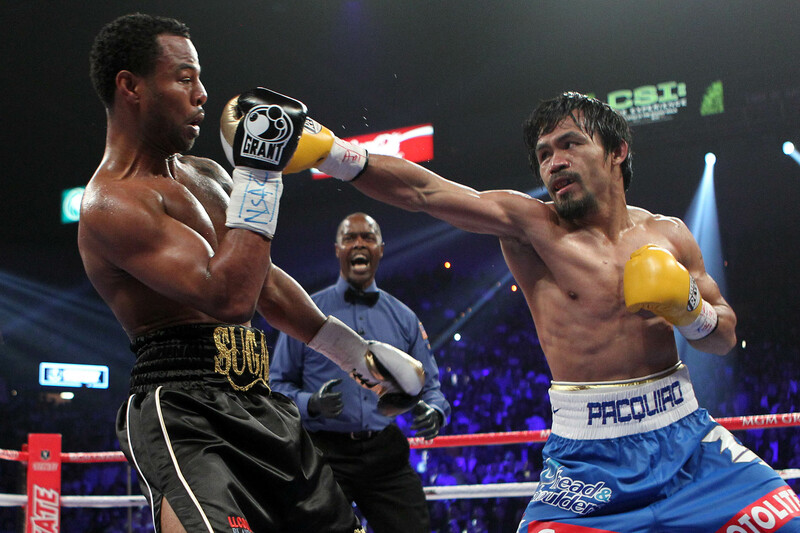 Mosley got credit for a knockdown in the 11th, but replays showed that southpaw Pacquiao went down from a push. 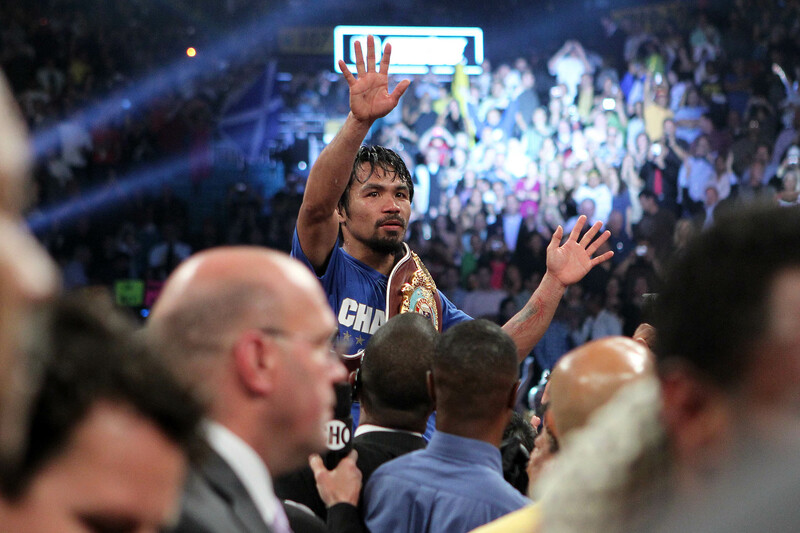 “We tried our best,’’ said Pacquiao, who is universally recognized as boxing’s No. 1 pound-for-pound boxer. “We both gave it our best effort. My legs tightened up during the fight. I couldn’t move. It’s the same thing that happened to me against (Juan Manuel) Marquez. It’s been happening to me more lately. Mosley, who has never been knocked out and is one of the great lightweight champions of all time, had nothing but praise for Pacquiao afterward. “You can’t blame age,’’ said Mosley, who, at 39, is seven years older than Pacquiao. 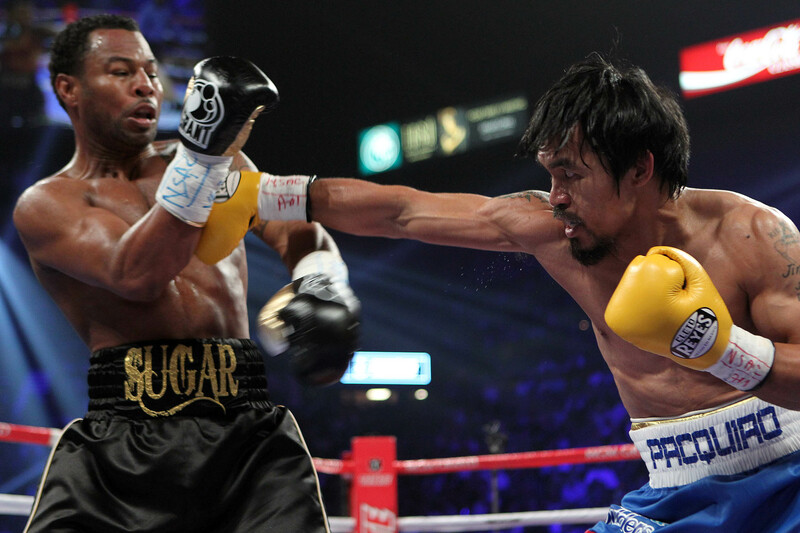 “Manny is an exceptional fighter. He truly is the pound-for-pound king. He has speed and power that I have never felt before. “It’s amazing. He’s cut from my cloth so I had to box tonight. The crowd-pleasing Arce, a former world champion at 108, 115, 118 and now 122 pounds, was ahead by five points on one of the scorecards and even on the two others going into the 12th round of what had been an action-packed, fast-paced bout before it was stopped at 0:55 when Vazquez’s corner threw in the towel. “I knew I could knock him out and I did,’’ Arce said. “My heart is too big. He’s a good, young champion with a big punch but my experience and my heart was too much for him. Vazquez was upset that the fight did not continue. Pavlik, making his first start since losing his WBC and WBO middleweight titles to Sergio Martinez on April 17, 2010, was triumphant by the scores of 99-91, 98-92 and 95-95. There were no knockdowns. Trainer Jack Loew was proud of his charge. “We had two wins tonight,’’ he said. “The first win was going up the steps, walking in the ring and competing after all the rehabs and everything he had been through. The second win was getting the win itself. Lopez felt he deserved better. Alvarado was ahead on all the scorecards by 30-27 twice and 29-28 when a weakened Narh could not answer the bell for the fourth round. The event was promoted by Top Rank, in association with MP Promotions, Sugar Shane Mosley Promotions, Tecate and MGM Grand. Gus Johnson (blow-by-blow), Al Bernstein and Antonio Tarver (analysts) called the action with Jim Gray reporting from ringside. James Brown hosted the event. The executive producer was David Dinkins, Jr., with Bob Dunphy directing.